There are two things more difficult than writing. Are you designing a card for the SoV or another project, or just for your own amusement? Are you struggling with getting the words right? *Please*, before you release your semi-coherent babble on the 'Scape-playing community, proofread to make sure your writing is as good as it can be. And, if you'd like, let me do it with you! This thread is for those who want help with editing their customs cards. I'm not going to help you with rules & mechanics; there are others better able to help you with that. But I would like to help you put a little shine and polish on your cards to help the wording be as good as it can be. I write and edit for a living, and I do a *heck* of a lot of both. I'm glad to put my skills to use for the 'Scaping community as much I can. 1. Give me a text version of the card or power you would like me to edit. Not just a graphics version. 2. Let me know if you intend to offer your card to the SoV or otherwise make it formal. I will not treat it *better* if you do, but I will treat it differently. 3. Let me know if you've borrowed language from official (or unofficial) cards. This is especially true if you've borrowed language from cards in custom projects such as the C3G, with which I am completely unfamiliar. Last edited by Dad_Scaper; August 24th, 2015 at 10:24 AM. I find it funny that the last word of the thread title is misspelled, hopefully that was on purpose . Also, maybe I'm not understanding this clearly, your asking for people who would be willing to correct spelling errors, correct? -NS, who would volunteer if that was the case. No. I'm offering to help people by editing their customs with them. And yes, that was deliberate. I'd be happy to help out -- I've thought that there's a need for this, to be able to workshop / get feedback on individual powers (as opposed to full figures) to get the wording clear and in keeping with 'Scape precedent. Well, this is a bad beginning. The volunteers I want are the ones who need help with editing, not those who want to help me. Thanks for offering, though! Here's one of mine that will head to SoV eventually. Let me know if there are any word issues. Thank you for doing this. Thanks for offering your services Dad-Scaper! If you ever see anything that could be improved on my super hero cards I'd be thankful if you'd give me a shout out! I'm attempting to be consistent, and (I think) so far so good, but another pair of eyes looking them over would be great! Grishnakh's cards are interesting to work with because he is less interested in copy-pasting text from official powers. It's a fun experiment to think "what's the simplest way to explain this so other gamers will understand the intent" rather than trying to figure out how to make the wording closely represent previously existing powers as much as possible. Well at least that had been the intent. I have started cleaning them up so they are a little closer to the official wording. I realized that some of my shorthand will only work for me. I do want them to be playable! By the way I love how you cleaned up the glide ability. I played batman over the weekend and he worked great! Grish, thank you for the honor. If there is one you would like me to help you with, share it here. Thanks to all for their kind words. "Viceron" appears to be a planet in a fictional world I never heard of before. It reads like "Viceroy," which is not problematic. The descriptor "the Blood Knight" sets up the Utgar connection and, more importantly, the theme of the unit as implemented through the powers. 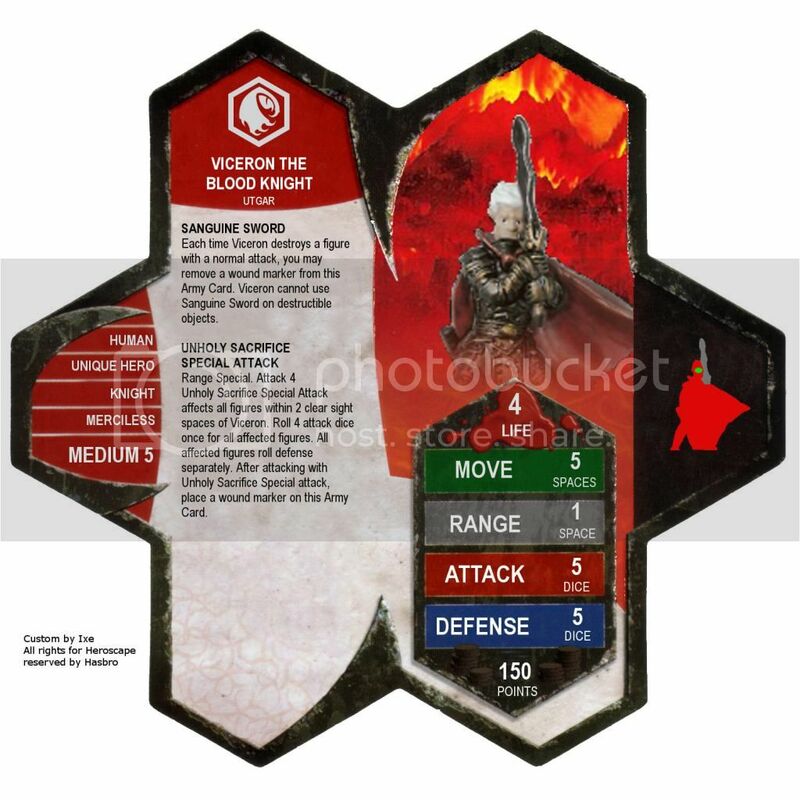 Each time Viceron destroys a figure with a normal attack, you may remove a wound marker from this Army Card. Viceron cannot use Sanguine Sword on destructible objects. Power Name: I *love* this power name. There's the obvious alliteration, and the common definition of "sanguine," which works (essentially "fortunate"), but even better is the second definition: Blood red. What a great name for a power on the Utgar hero, Viceroy the Blood Knight! The wording on the power looks fine. I leave it to the rules experts to review your use of the word "cannot" in this context, or perhaps this is based on another unit and is already canonic. I was a bit confused at first because I thought the victims were the things being "sacrificed," but then I realized he is sacrificing himself to trigger the ability. Looks good. I am sure there is ample support for the power language; I don't see any word usage issues here. The spelling of all the stray words looks fine (Utgar, Human, etc. etc.). Looks good, Ixe, thanks for sharing. On a side note, I like very much how the powers play off against each other. I took the liberty of moving this thread to the broader "customs" forum, where it belongs.